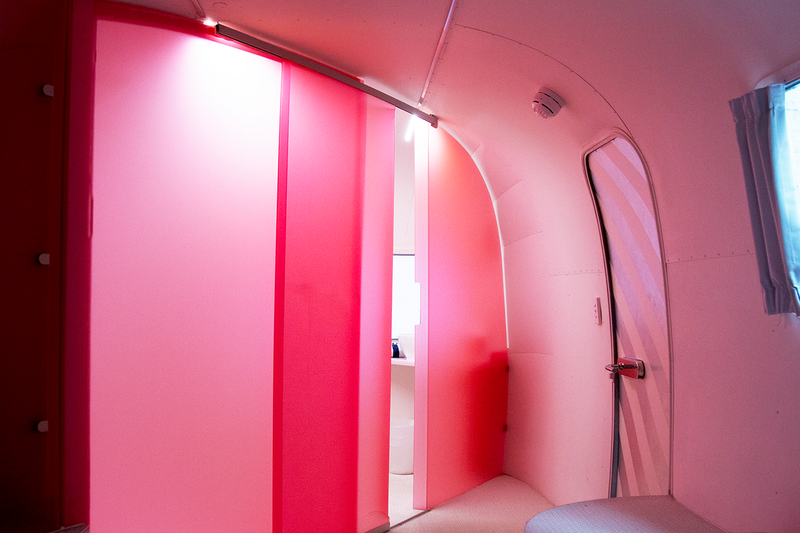 Inside the NOTEL Airstream with Benefits. You may have seen it on the internet somewhere, possibly (and most probably) Instagram. 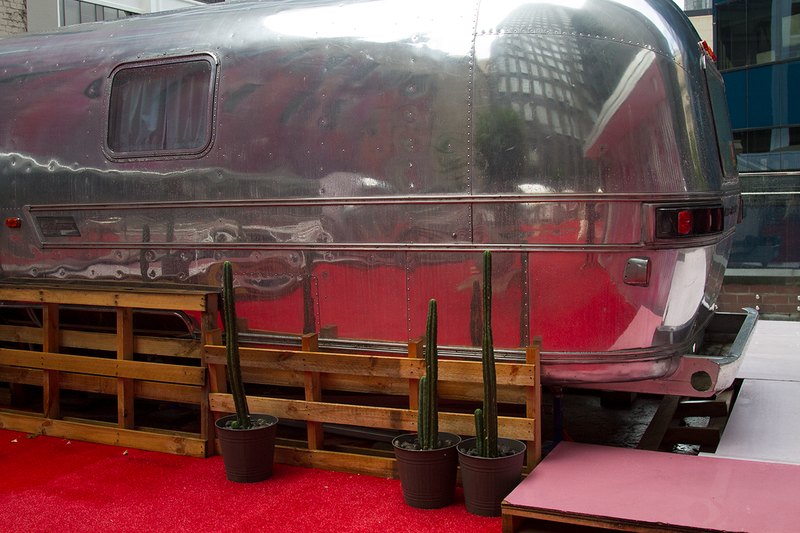 Melbourne’s caravan hotel – the six chrome airstream trailers against a pink backdrop, overlooking Flinders Lane. In terms of uniqueness, NOTEL is probably one of the best hotels in Melbourne. 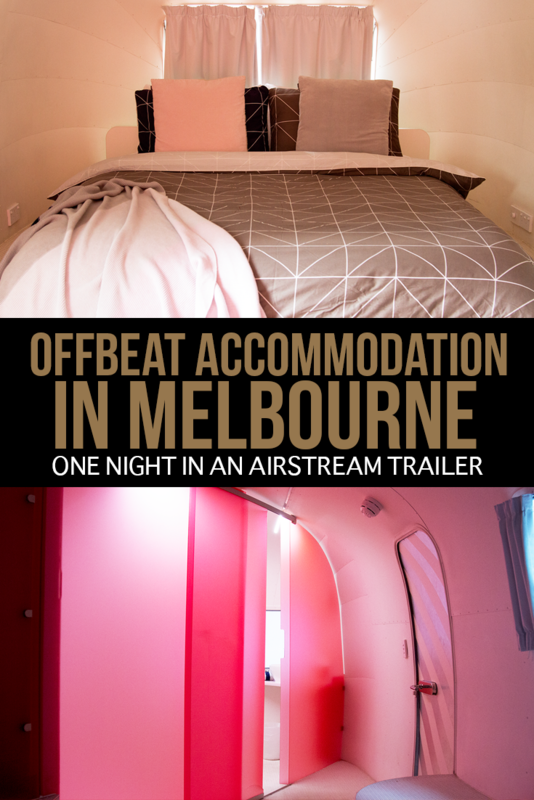 These trailers – known as NOTEL (not your average hotel) – are definitely the ideal accommodation for anyone looking for an alternative space to spend the night in the city. Or, those like myself who live in Melbourne and fancy a little local holiday – a fun night in with a friend or your other half. 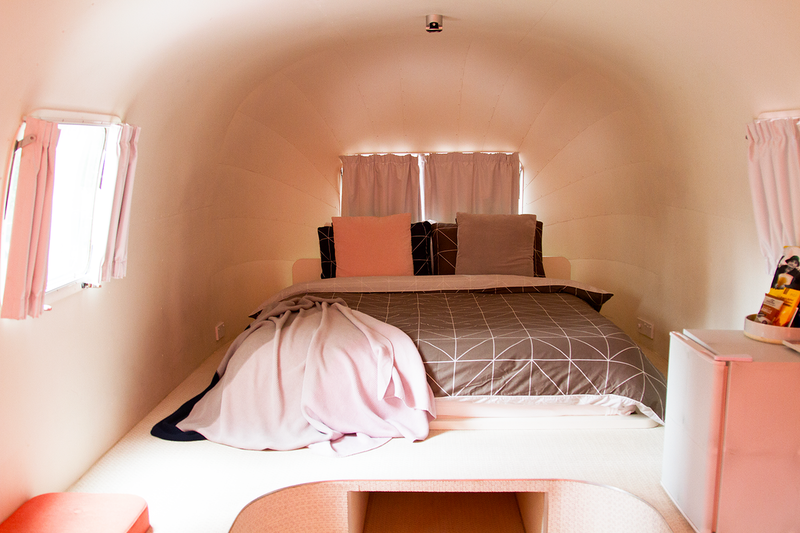 I recently booked out one of the trailers – and if I was going to do it, I figured I may as well go the full nine yards and reserve the Airstream with Benefits. This kitted out beauty came with its own private deck and best of all, a HOT TUB. I don’t know about you, but I’m all for immersing myself in hot or cold bodies of water for hours on end, so it seemed like a good deal to me. Click here to check out NOTEL’s prices and availability, or read on for more information! Check in time is from 3pm onwards, but there’s no concierge at the NOTEL. In a manner that is extremely high tech, you receive a key electronically, via an app. You don’t really get a lot of clues as to where the entrance is and I’d helpfully just got off a plane from Thailand and was feeling a bit loopy. Luckily, NOTEL sits above a carpark and the staff there are very helpful. Once you’ve puzzled your way through a series of doors, you’re in. The electric key is good until 11am the next morning, check out time. The downside is that you have to have your phone on you at all times. Don’t leave the trailer without it and be careful particularly not to have the door slam shut with your phone inside and your body on the outer! 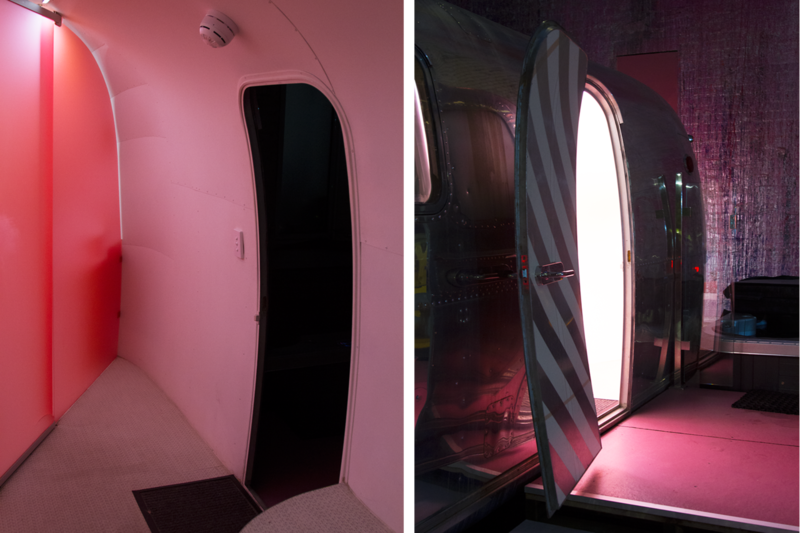 So, what will you find inside one of the NOTEL airstream trailers? Everything you could need for one night. There’s a comfy queen-sized bed, a bar fridge (more on that soon), an alarm clock with a charger and docking station and an iPad (which you can watch Netflix on). There’s split-cycle air conditioning, keeping the trailer cosy or cold – much needed for a city with completely unpredictable weather activity. 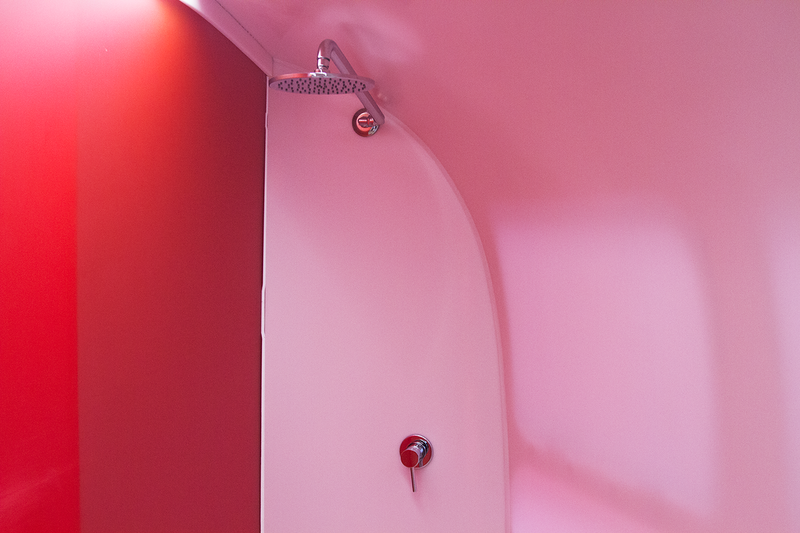 The bathroom is decently-sized for a trailer and outfitted in pink. The shower was hot and very pleasing and I was happy to see that NOTEL used the same brand of recycled toilet paper as I do! Outside the trailers is a deck with a table and two chairs. Five of the trailers look out onto each other in a communal living space. The sixth with Benefits trailer has a private deck, which looks out onto Flinders Lane. All in all, the trailer comfortably sleeps two, making it an ideal escape for couples celebrating a birthday, anniversary or just each other! I imagine it would be quite fun to grab a girlfriend and spend a giggly night there together – or hell, go on your own. You’re in for a nice night, regardless. 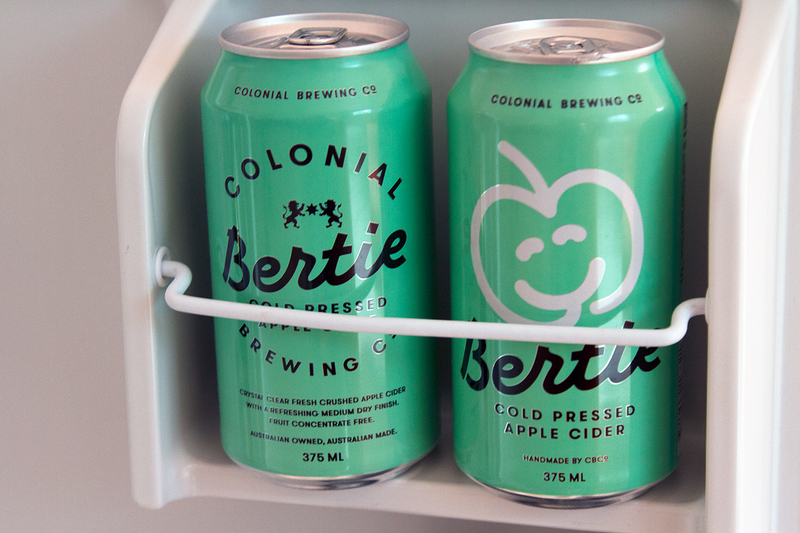 Some of the supplied goodies in the bar fridge. 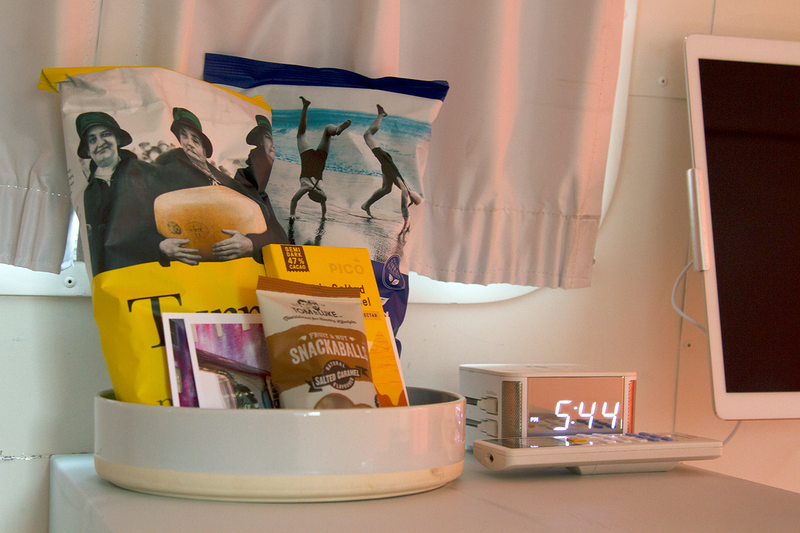 So, what is there to do once you’re ensconced in your airstream trailer? Well, it’s pretty easy to fill a night, as it turns out. Having booked the trailer with benefits, we had access to the super sweet hot tub (which flashed difference colours once you pressed a few buttons, NOT THAT I GOT A PICTURE OF THIS). 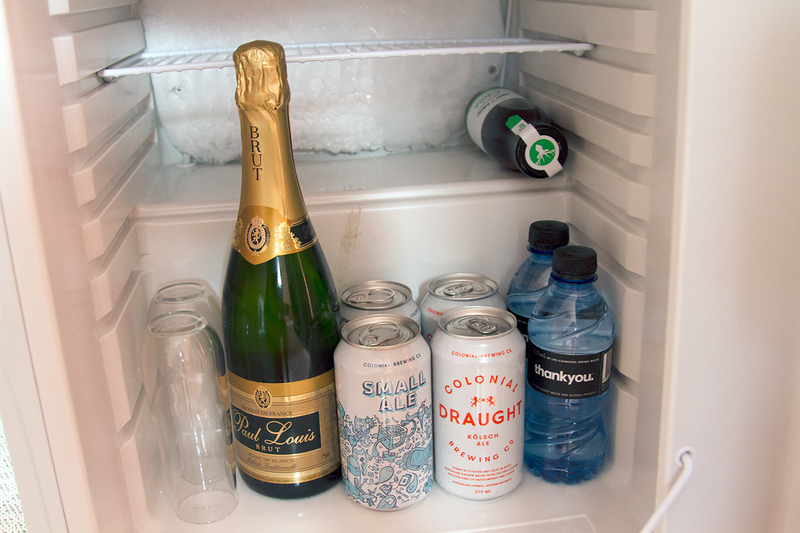 In all trailers you’re provided with a super sweet bar full of goodies, mostly of all the alcoholic variety, although there are a few soft drinks on offer too. Popping open the bottle of champers to drink in the hot tub, is certainly an experience worth having. There’s also some chocolate and chippies, if you fancy a snack. As far as dinner goes, the trailers are located in Melbourne’s CBD (Central Business District) and it’s a certainly a city that is known for its array of good food. You could go dine centrally, but I chose to get takeaway instead. 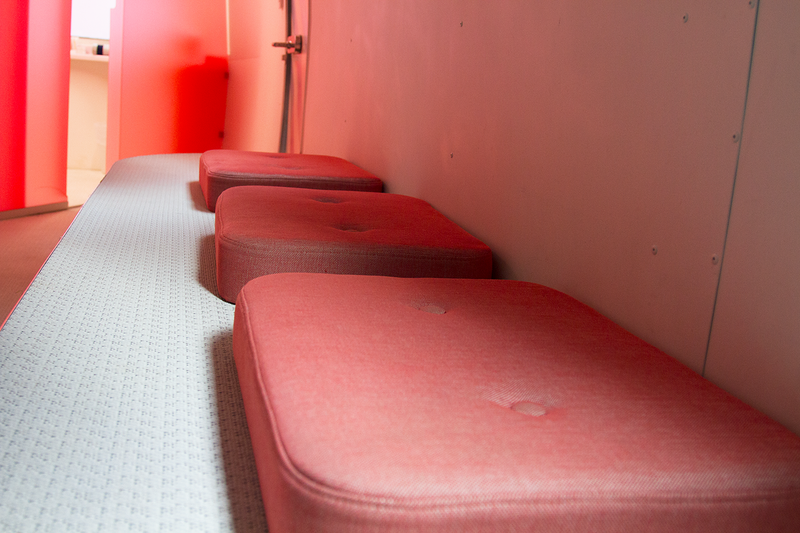 This wasn’t just any sort of accommodation – it was providing the experience itself. And the less time spent foraging for food, meant there was more time to be spent in the hot tub (which totalled roughly six hours in the end, you can’t say we didn’t make good use of it!). What kinda prices are we looking at, here? 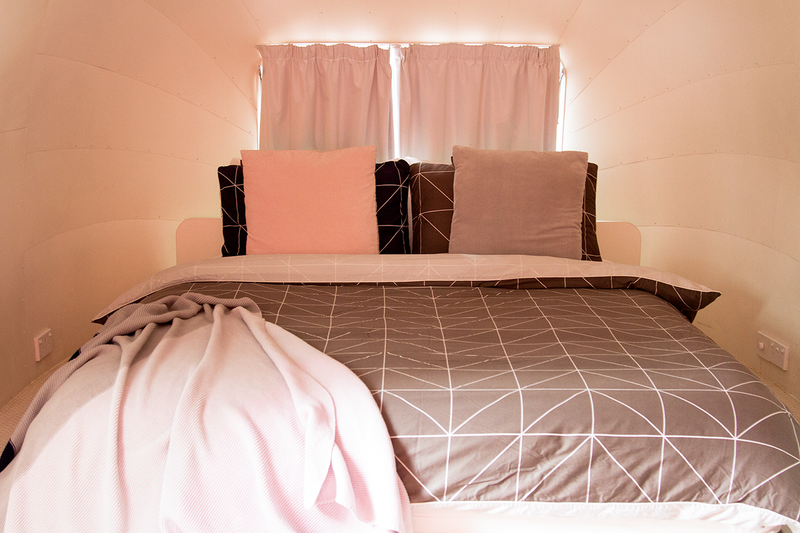 The five NOTEL trailers are priced at $395 each – the Airstream With Benefits at $440. A bit out of your price range? 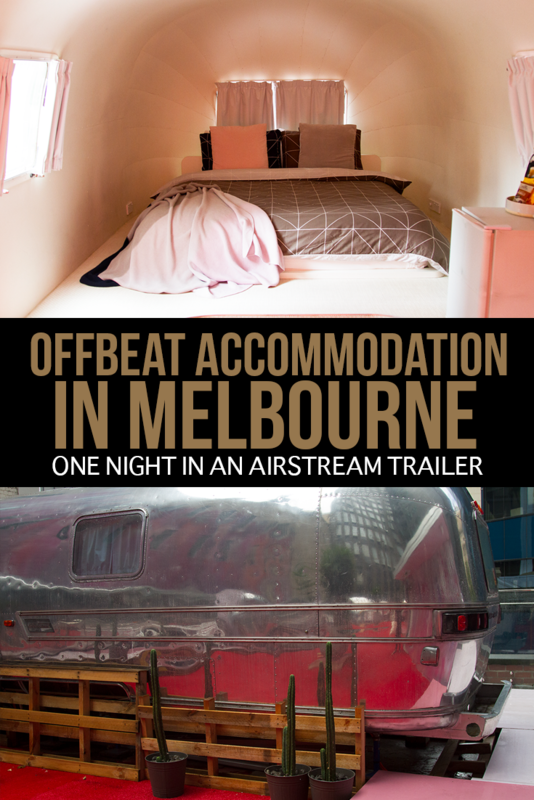 Search for cheaper accommodation in Melbourne here. All in all, it makes for a fun night in the city of Melbourne – whether you’re a resident, or just travelling through. If you’re looking for other places to stay in the city, here’s a list of Melbourne’s best neighbourhoods for travellers. 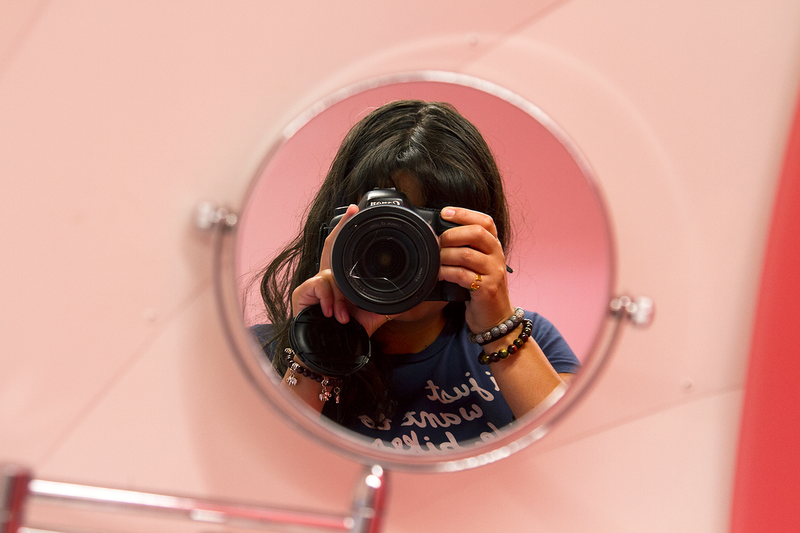 Make sure you read this post on quirky date options in the city as well. Heading to Melbourne sometime soon? Stick a pin on this post for future reference! Very “millennial pink”. That looks like a lot of fun. 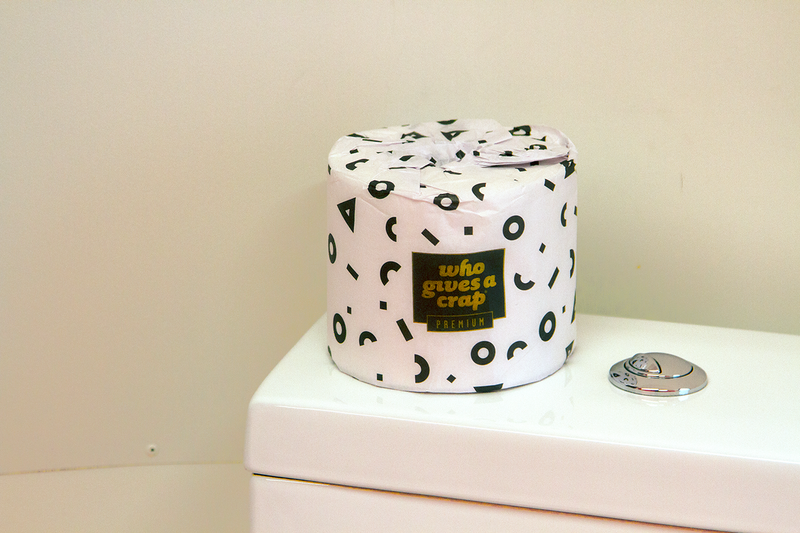 The branding on that toilet roll is nothing short of awesome, haha. In all seriousness though, this looks like a great alternative to a hotel in the CBD especially for an occasion! They’ve renovated the trailers really tastefully and they look super modern and homey. Thanks for sharing your experience! Haha I find such joy in displaying them in my own place. Thanks Alyse! Totally recommend trying it out next time you’re down south. love the toilet paper packaging! wow why does au accomodations have to be reallt expensive? but if i have to spend hundreds of dollar in an accomodation, i would surelt pick this ? Not sure – I wish they weren’t! Thanks! I’ve had the Pitbull song stuck in my head since I wrote this post, somewhat annoyingly. Looks unique but cosy! I would totally try it out! It’s worth a visit, for sure!